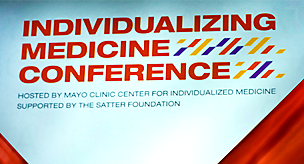 Quoting “the great poet from Hibbing, Minn.,” genomics pioneer Richard Weinshilboum, M.D., captured the spirit of the third annual Individualizing Medicine Conference 2014: From Promise to Practice when he invoked the legendary Bob Dylan. “‘The times they are a changin’,” Dr. Weinshilboum said. The times are changing indeed. More than 750 physicians, researchers, scientists, medical staff, genetic counselors and others gathered in Rochester, Minn., to exchange ideas, engage in debate and hear the newest developments in genomics and individualized medicine. No longer in the realm of science fiction, genomics has increasingly entered the mainstream of modern healthcare. But how to go from base pairs to bedside, from double helix to healthcare? The conference offered a practical approach to helping medical professionals discover and integrate genomics technology into routine patient care. And with that comes challenges. Opening the conference, Dr. Gianrico Farrugia, Director of the Mayo Clinic Center for Individualized Medicine, issued the first of many challenges to come. Keynote speaker Clifford Hudis, M.D., immediate past president of the American Society of Clinical Oncology (ASCO), offered a challenge of this own: we need to reexamine how we define value in cancer care. If the practitioners don’t, others will. He highlighted current approaches to drug development as unsustainable, that there is no relationship between cost and value. Two-and-a-half days of plenary sessions featured experts such as Richard Gibbs, Ph.D., Baylor College of Medicine Human Genome Sequencing Center; Diana Bianchi, M.D., Tufts Medical Center; Geoffrey Ginsburg, M.D., Ph.D., Duke University; Rebecca Nagy, M.S., C.G.C., Ohio State University; and Dan Roden, M.D., Vanderbilt University Medical Center. Moderator Ceci Connolly, Health Research Institute, PwC, probed deeper into the issues with insightful questions and a curiosity about where we might be going with genomics. And each day brought new challenges. A representative from the pharmaceutical industry, Lon Cardon, Ph.D. challenged the genomics community to help the industry develop better drugs faster. A late stage failure, Cardon explained, which is where most of the failures occur, can take 12 years and costs over $1 billion in research and development money. “We need to do a better job earlier with better target validation,” Dr. Cardon said. In all, an international audience from 13 countries and over 535 different organizations listened to 45 speakers discuss topics ranging from prenatal genomic testing and pharmacogenomics to genomics and drug safety, from the changing role of genetic counselors to the legal and ethical obligations for biobanks. Some of the top experts also spoke on the present and future roles of insurance, reimbursement, drug labeling, predictive genomics and electronic medical records. There was also a pre-conference workshop to introduce genomics to practitioners, and post-conference workshops took nearly 500 attendees into the hard science of genomics. Dozens of case studies were examined in detail to an eager audience. Subjects in the post-conference sessions ranged from “Bugs and Drugs,” a workshop designed to look at the common interest of microbiome and pharmacogenomics, to “Biomarker Discovery At Mayo Clinic,” a session geared toward the clinic’s efforts to clinically validate newly discovered biomarkers and translate them into clinical practice. Through the years, genomic scientists, physicians, counselors and everyone else involved have risen to the challenges presented by this cutting-edge field in medicine. Next year’s Individualizing Medicine Conference promises to answer many of questions from this year’s conference and pose new questions of its own. If you’re up to the challenge, mark your calendar for September 20 - 23, 2015. After all, the times they are a changing.